This past week at Powell, we had the pleasure of hosting the Flutacious! staff -- Cynthia Kelley (Owner), Amy Tori (Director of Sales and Marketing), and Kathryn Brooks-Dean (Repair Technician). The team gave us great feedback on our current products and also spent the week with our finishers and repair technician. We had a chance to sit down with Amy and Kathryn between their sessions in the finishing and repair departments. As mentioned above, Kathryn is the repair technician for Flutacious!, and Amy is working in their repair department as well. Kathryn shared that she mostly sees flutes coming in to the shop for a COA or overhaul -- and this is actually the bulk of what our repair technician sees as well! She and Amy met with Powell's repair technician, Rachel Baker, to share best practices in everything from general repair to removing dents in headjoints. When we caught up with Amy and Kathryn in the finishing department, they were working on pinning Signature flute mechanisms. Of course, we know that the finishing process involves many more steps, all of which Amy and Kathryn had the chance to practice during their visit. Speaking with Kathryn and Amy during a break for lunch, we asked them about their most memorable experiences during the visit. They were both quite impressed with the expertise of one of polishers, Aleks, in the care he took with his work and the precision in his polishing technique. They also enjoyed their time with Rachel Baker, learning more about her work and, as Amy Tori shared, "the way in which she has everything so well organized and has a particular method to working with so many flutes at once." Amy also commented that everyone she met, from repair to finishing, had very defined processes for their work, and although their methods may have varied from person to person, everyone "knew exactly how they wanted things done." There were some very poignant statements that Amy and Kathryn shared about their experience at Powell. Kathryn commented that she was "amazed at the amount of people working with their hands -- the true hand craftsmanship that goes into making these instruments." 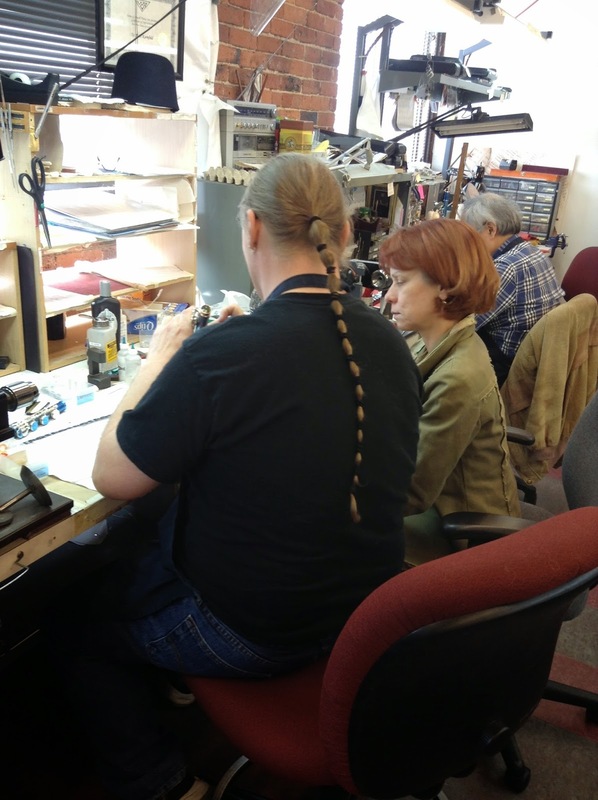 Amy noted the correlation between repair and flute making as she witnessed it at Powell. She shared, "When flutes come in to the shop, we think about what we will need to do the repair -- essentially, what we will do to fix a problem. But, here at Powell, we learned that repair is not just about fixing a problem, it's about returning the flute to its original condition. Being here, you really get a sense of how the flute is supposed to be after repair, because you get to see how it was made originally."